← Living Abroad: In What Language Do You Feel Emotions ? I am going to focus mainly on people moving abroad or expatriates going back home but the theory applies to anybody experiencing emotional stress when moving to unknown environments. During big life changes, we experience stress, overload, or threat and often lose control of our emotions and make “thinking errors” or distortions about the reality. Our thinking process starts by interpretation and processing events that leads to our emotional and behavioural responses. Since a wrong thinking leads to a wrong behavior it is important to be aware of our thinking. Many people heard about “culture shock” but most of the new expatriates are not aware of what that process means to them until they are really confronted to a succession of emotional ups and downs. Same with the grieving process, also called “reverse culture shock” that most expat families experience when they return to their home country. In both cases our states of mind impact our well-being. Here a great video that explain the “repat grief “. Professor Aaron T. Beck, first described the theory behind “thinking errors” or “cognitive distortions” that our brain make under stress that impair our judgement of a situation leading to poor decision-making, irrational behaviors or depression. Evidence that supports your bias is selected, favored, or weighted more heavily than evidence contrary to your bias. We take the negative details and magnify them while filtering out all positive aspects of a situation. For example you may conclude that everything was better before you moved abroad and you are constantly whining about your new life: the food is bad, traffic is terrible, people are rude etc. You are so focused on the negative that it is hard for you to meet new people or learn about your new culture thinking your expat life is like being in jail. In polarized thinking, things are either “black-or-white.” It implies that something can only be one or the other, but not both. 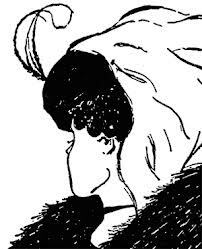 Consider the image on the left, an optical illusion, demonstrating the limitation of our visual perception system: we can only see either the old lady or the young woman at any one time but not both. Taking sides polarizes opinions and hardens attitudes, creating conflict and separation between different cultures. So be careful if you are abroad and embarked in a political or religious debate, people passionate at those topics typically have strong opinions about what is right or wrong and you may jeopardize good business deals by giving a polarized opinion, so be subtle. 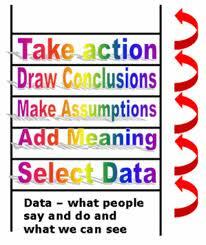 The Ladder of Inference describes this type of thinking process starting from our perception and interpretation of a fact to a decision or action (see right). It is very easy to get into trouble when we don’t know the social rules and etiquette of a new culture and filter other people attitudes according to our own cultural rules. For example we might think that a certain group of people are not sincere because they don’t look straight in the eyes when talking, while it is interpreted as rude by many Asian cultures. It is interesting to note that time has not the same value in different cultures, Latin cultures like the French see time as elastic, being 15 minutes late to a meeting is not considered impolite or showing lack of interest, while in North American, time is money and you are supposed to arrive just on time at meetings. In this cognitive distortion, we come to a general conclusion based on a single incident or a single piece of evidence. If something bad happens only once, we expect it to happen over and over again. For example we can have our wallet stolen and conclude that the all country is unsafe while in reality this event could have happen anywhere. We hold other people responsible for our pain, or take the other track and blame ourselves for every problem. Nobody can “make” us feel any particular way — only we have control over our own emotions and emotional reactions. For example a frustrated accompanying spouse may feel resentful towards the working partner because she thinks she made all the efforts having left behind, friends, family and often a rewarding career and gain nothing in return but struggles. If you are experiencing those kind of struggles, it won’t help if I tell you that almost all expatriates have been in your shoes, but talking to a professional coach, may make your life easier in only few sessions. Talk to me and check how I can help you. This entry was posted in change, Cross cultural, culture shock, Executive Coaching, Global Executives and tagged Aaron T. Beck, Cognitive distortion, culture shock, expat executives, expat following spouse, expat life coaching, Expatriate, Psychology, Social Sciences, Stress management. Bookmark the permalink. Anne, I am an American living in Germany for four years, and am working on my graphic design thesis, where I will make a magazine designed for language learning and reading comprehension in interesting topics. Could I use this article about 7 steps for expatriates in the magazine? it will be translated into german and spanish, it’s a university project, I won’t be profiting off of this. Excellent article to read if you ever have been or will be an expat! This is another article which should be required reading for EVERY expat.